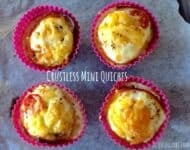 Crustless Mini Quiche - gluten free and made with real, whole foods. I love making these little crustless mini quiche. They are so easy to do, and you can freeze a whole batch of them for school lunches. Add whatever vegetables or cheese you fancy. How about some spinach at the bottom, a chunk of blue cheese, cream cheese, asparagus, mushrooms etc. They have only 1.2g carbs and high in fat to keep you full for longer. You can even use the same principle to make a crustless regular quiche. Line a regular quiche dish with bacon, crack eggs on top, add vegetables, cheese and seasoning. Add salmon, cream cheese and dill? That would be my favourite. Take a look here for more low carb snack ideas. By eating LCHF, snacking is usually a thing of the past, but sometimes we need a little something. 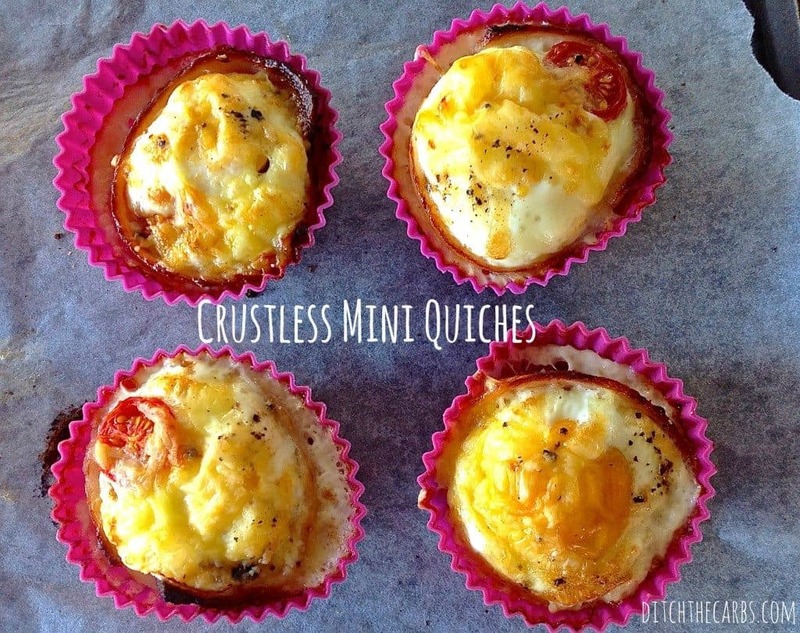 Crustless mini quiche are adaptable and can be favoured with any herbs and spices you like. You can even hide vegetables in them so picky kids can amp up their greens. Line each cupcake case with the bacon, making sure the sides and bottom are fully covered. Crack an egg into each bacon lined case. Place a cherry tomato into each egg, sprinkle with the grated/shredded cheese and finish off with salt and pepper to taste. 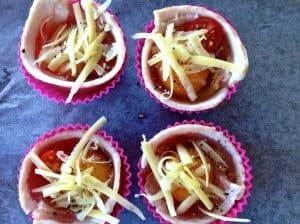 Place each cupcake case onto a baking tray and bake at 180C/350F for 15 minutes. Yes you can go without the crust, that would be a great way to make them. It is such an adaptable recipe, just add whatever you fancy into them too. i dont eat cheese but my family does. as a result, i dont often know which cheeses work best when. Is there one in particular you like to use when making these? I tend to always have a big block of Edam, Colby, or mild at hand. I also have used mozzarella (the pre shredded type) too. Great idea, I’ll see if I can do this next time I make them. These are great… simple to make, and good to eat hot or cold from the fridge. They came out of the greased muffin tins with no trouble. I can see lots of possibilities with ingredients and they will be excellent food to take on day hikes. How much is a rasher of bacon, and do you fry it first or put it in raw? Thanks! A rasher is a slice of bacon, and no you don’t cook them first. 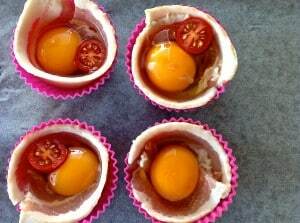 You line each muffin/cupcakes case with a raw bacon slice and it will cook as the egg and cheese cooks. I agree. Still sounds good, even if it is just an omelette. I send all my children to school with lunch boxes, all cold from the fridge with no feezer blocks. In over 10 years of lunch making for 3 children and my husband they have never got sick. Food is only out of the fridge for a few hours. I am in NZ where it can get up to 30C in the summer. If you really are concerned, send with a chiller block or in a thermos if you want to serve them a warm meal. How do you defrost them? Just unwrap each slice and put them on the kitchen bench or in the fridge to defrost. I would love can post the baking temperature in Fahrenheit. I am slowly going through my recipes and making them more international. Most of my baking is done at 180C which is equivalent to 350F. There are loads of oven temp conversion charts online, just print one off and keep it in your kitchen! I love your site. The recipes are delicious. Thank you. No all my nutrition panels are total carbs as some people count total or net so I leave it up to them. These are guides only as the brands of cheese, milk etc you use can vary considerably in carb counts so if you want an accurate count, use MyFitnessPal and enter the brands you used.